The Annual Meeting of the World Economic Forum in Davos, Switzerland has concluded about a week ago. There are many good summaries of the 2019 Davos meeting available online such as on the WEF link: https://www.weforum.org/focus/davos-2019 and I recommend them to you. In this note, I am sharing some of my takeaways from the meeting as they relate to global innovation. This year, there was a palpable sense of anxiety in the air, driven by some opposing viewpoints. One, there was concern amongst delegates from developed economies about the state of their economic, social and political systems. The rise of populist movements, the eruption of social anger through movements such as the “gilets jaunes” in France and the decreasing hope for a better future for the next generation in developed economies contrasted with pride in recent rapid economic progress and an optimism for growth and a brighter future amongst participants from emerging markets - not just from Asia but also from many African nations. Rare was talk about broken economic systems or failed political leadership from these delegates, despite the acknowledgement that all was not perfect and their developing countries also faced many formidable challenges. 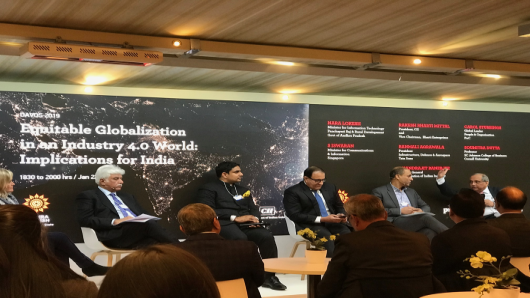 It was not a surprise to see the strong emphasis placed on the 4th Industrial Revolution (4IR) during the Davos Annual Meeting. The overall theme of the 4IR permeated all aspects of the program. For example, there were many sessions on how the 4IR was impacting and enhancing globalization. I was invited to moderate one such session on how the 4IR was impacting the achievement of the United Nation’s (UN) Sustainable Development Goals (SDGs) and the group quickly converged on how technology will have to play a key role in scaling up solutions to help achieve the SDGs. Nevertheless, the optimism around technology and its positive benefits was tempered by strong concerns around privacy, data security and the rise of surveillance capitalism. Indeed, the pessimists felt that we were entering a no-return phase of technology having a negative impact on our personal and societal well-being. Add to this the concerns about the persistent digital divide (about 45% of the world’s population still remains un-connected to the Internet) and the impact of artificial intelligence (AI) on jobs, and the picture became gloomy. Finally, there was a marked sense of frustration about broken global governance. While increased cross border data flows have made the world more connected, global governance systems were criticized as being hopelessly inadequate in dealing with the increased complexity of a fast changing and inter-dependent global world. Professor Klaus Schwab in a letter (dated 1st Feb) to Davos participants best described this as “the system seems to have spun out of control” and “the steering mechanism for global governance is not sufficiently equipped to deal with the challenges at hand”. The reticence of the USA to share its historic leadership role in global matters and the impending rise of China as the world’s dominant economic power added a sense of concern about the future direction of global governance. While there is no one easy solution to the above set of concerns, I came away with the conclusion that whatever we do in the future, inclusive innovation has to be at the core. Innovation is key because “business as usual” or “maintaining the status quo” is not a solution. We have to innovate not just from a technological point of view but in the different ways in which we come together for global governance, set corporate objectives and shape society for this century and beyond. Professor Klaus Schwab and others have argued for a new global system that is more stakeholder based (inclusive of business, government, society and individuals) and is respectful of multipolarity and diversity (recognizing the reality of the world today). As we innovate, we have to become more inclusive and more focused on putting people first in the face of increased complexity, rapid technological change and the need to reduce inequality. As Co-Chair of the World Economic Forum’s Global Agenda Council on Innovation Ecosystems, let me address the specific issue of inclusivity in innovation ecosystems. As innovation ecosystems are an important avenue for creating economic and social value, it is important for us to ask if our current ecosystems have successfully addressed the most pressing issue on the global agenda: namely that of supporting inclusive and sustainable growth. As noted in my co-authored blog for the World Economic Forum the answer on this front unfortunately is not that heartening in most cases. Despite the outstanding successes of innovation ecosystems in areas such as Silicon Valley, London and Bengaluru, large parts of the world, especially rural areas, remain largely untouched by the successes of these innovation hotspots. The urban-rural chasm has contributed to the rise of populist political ideologies in many countries. Making innovation ecosystems more inclusive will not be easy but it can be done. It will for example require new financing vehicles - capital that is patient and emphasizes inclusivity and not just profitability. There is a need to broaden the procurement base and level the playing field for innovators. Procurement strategies need to become outcome focused and support inclusive and sustainable growth. We will need to be conscious about mapping out ecosystems and including stakeholders who previously were either ignored or left on the margins. It is hard if not impossible to stop technological progress. It is also not the right thing to do as many solutions for problems such as for global warming depend upon future technological breakthroughs. But it is possible to shape how technology is deployed for innovations in society. For example, the Internet has revolutionized the world around us and benefited individuals, corporations and society in so many positive ways. At the same time, it has opened up windows for corporations to harvest personal data (often without permissions or adequate consumer knowledge), for governments to monitor citizen movements and behaviors (often in the name of security) and for rogue elements in society to come together and stimulate unrest (as with the case of fake news). These undesirable impacts can be curtailed or even stopped if we put people first, if we make respecting human dignity a priority (and not abusing human privacy), if we invest in people to help them transition through technological disruptions (such as AI) and if we make inclusivity the core of how we build our innovation ecosystems. Inclusivity with a human face has to become a mantra for our global governance, for our political and societal systems and for our corporations. If we not see tangible progress over the next months, I fear that the level of anxiety and hopelessness will only ratchet up, come Davos 2020.